With windows looking east and south (mountain views when its clear out! ), this room feels open and has good natural light. This bungalow front porch offers you a place to shake off the rain, or set up a porch swing. This spacious eat-in kitchen is one of the favorite features of the homeowners. They host 15 for holiday dinners and love the light coming in through the big sliding glass doors. It’s nice to stay home, but this central location gives you lots of reasons to get out and about too. The family calling this bungalow home these past years loved to pack the kids in the stroller and get out of the house with a walk to Proctor. On nice days, they’d head all the way to the park and playground at the top of the Puget Creek Natural Area, make a stop at GardenSphere, then visit the public library and pick up some groceries on the stroll home. Sounds like good way to spend the day. From this location, you’re in the center of the city, under 10 minutes from the Tacoma Art Museum downtown, but also less than 5 minutes from 3 different grocery stores, half a mile from Valhalla Coffee Co, and just over a mile from other 6th Avenue destinations like The Red Hot and Ice Cream Social, or Proctor favorites like Metropolitan Market. This is just an introduction; don’t miss our dedicated location section below! 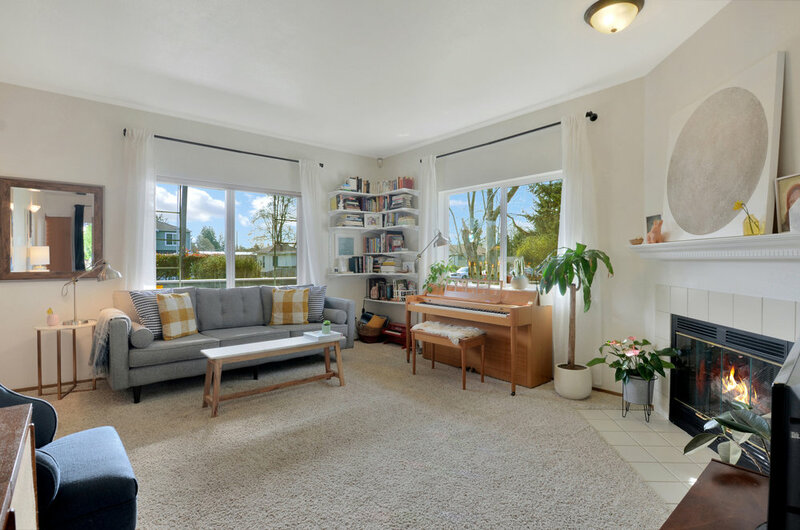 Continue on for the video tour, photos, neighborhood highlights (including travel time and distance to a list of Tacoma favorites nearby), and many more details about this home. This big 3rd bedroom overlooks the front porch and offers lots of flexibility. Set it up as a bedroom, or take advantage of the opportunity to create a home office and playroom as shown here. This fully fenced back yard combines a manageable lawn space with landscaped beds, and low maintenance rock in the fire pit and bbq area. A patio and deck extend the living area from the kitchen and become a second dining room in the warm season. From the entry, take a left into the bright living room with its high ceilings and propane fireplace. Don't miss the convenience of the coat closet and hardwood floor in the entry area. On entering this home, one immediately sees it is cared for and loved. Green plants thrive, curtains are opened wide for window light, and the clean white paint palette lifts the ceilings even higher. When you step in, a hardwood entry provides a place to stop and take off shoes, or set down groceries. A coat closet is directly on hand for stashing jackets and boots. Then turn left to come into this living room, both open and cozy at the same time. A propane fireplace is ready to warm up chilly evenings and accompany late night chats or early morning reading sessions. And since the house to the south is set far back on the neighboring lot, there’s a view out to an open yard and cedar tree from the window over the piano. Book shelves in the corner make good use of space and offer a place for favorite volumes alongside photographs, and treasures. Wainscoting brings classic character to the room, while cabinets under the kitchen island provide even more kitchen storage. The opening to the left leads into the bedroom hallway. A few steps through from the living room toward the back of the house brings you to the spacious kitchen with sliding doors leading out to the patio and deck in the fully fenced yard. Pull up a stool for coffee, a snack, and casual family meals at the kitchen island, or set the dining table for dinner. This room is one of the family’s favorites as there’s plenty of space to move around, and they’ve enjoyed hosting Christmas and Thanksgiving for 15. A window above the sink overlooks the neighboring cedar tree and the kitchen island offers additional drawers and cupboards. (Plus, there are big pantry cupboards in the garage!) The wainscot brings classic character to the room and all the neutral tones invite a sense of calm, or let you bring in bright color spots for contrast. Set up for dinner in the dining area, or gather around the kitchen island for casual family dinners. With a full set of appliances (refrigerator/freezer, stove, dishwasher, and vent), this kitchen is ready for you. Along with a large clothes closet, this en suite bedroom features the high ceilings and bright neutral color palette found throughout the home. One of 3 bedrooms in the home, this room features a private en suite full bath with a jetted tub. Take the hall between the living room and kitchen and you’ll find this en suite bedroom with its private full bath. The full bath is set with a jetted tub for a relaxing soak, but of course there’s a shower head too for your everyday routine (if a relaxing jacuzzi soak is the every day routine for you, you’ve found your home). A large vanity with cupboards and drawers for storage and a wide countertop complete the bathroom. 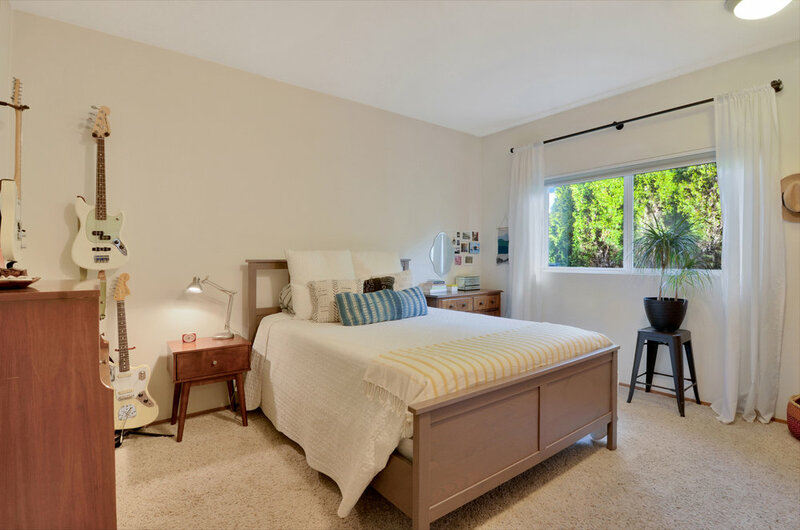 The bedroom features the same beautifully high ceilings and calm tones found throughout the home and also offers a large clothes closet and a window looking north out to the side yard and hedge. This full private bath completes the en suite bedroom. A jetted tub makes this an ideal spot to relax and the huge vanity provides good storage. Just down the hall find this 2nd of 3 bedrooms perfect for kids, teens, or guests. Window faces north toward the side yard and hedge. The second bedroom is only a few steps away and is a perfect room for kids, teens, or guests. Embrace the bunkbeds for a shared siblings room, or just for the slumber-party-potential fun of it. This room also looks north into the side yard. 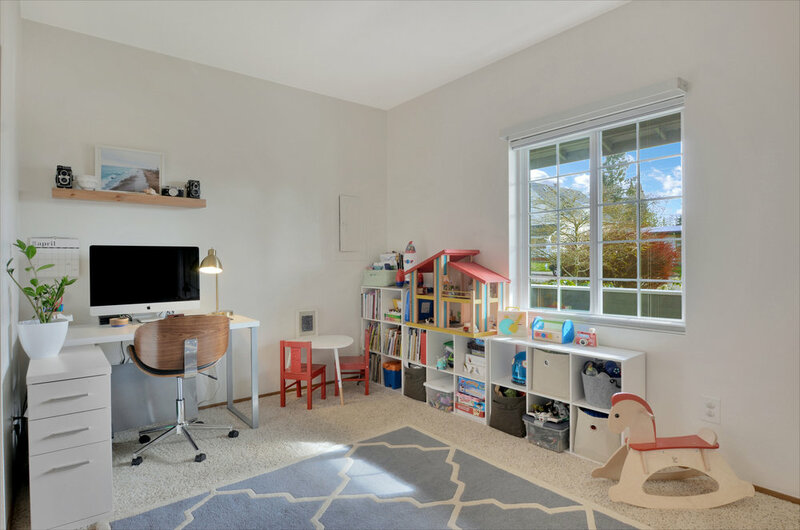 Depending on the needs of your family, you can spread out into the third bedroom down the hall, or save that room for an additional playroom, a home office, studio space, or guest room. 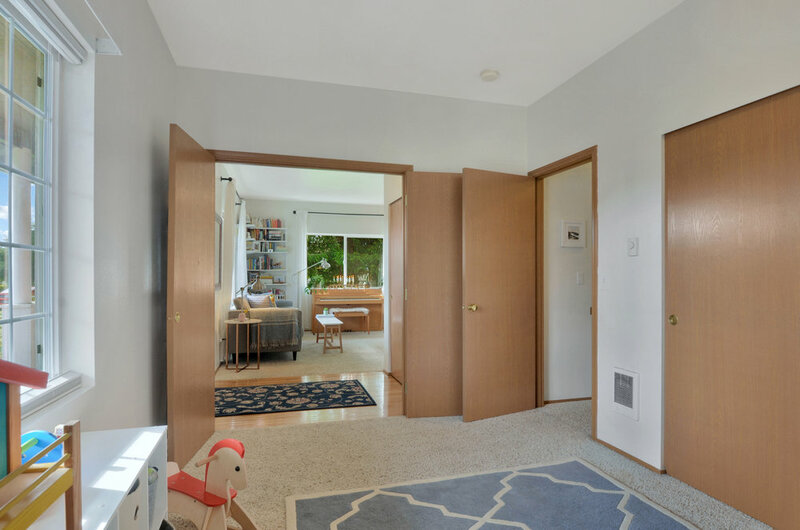 The beauty of the third bedroom is it gives you flexibility with its double-doors that can open up to the entry and living room to give a circular flow to the layout, or can remain closed to create a private bedroom or office. Both the second and third bedrooms have closets with sliding doors, and easy access to the full bath just across the hall. Looking from the 3rd bedroom out into the living room and hardwood entry. This room includes a big closet, and access to the right into the hallway with the full bath. The doors can be closed to keep this room private, or opened to connect to the living space as shown here. The 2nd full bath with its tub/shower combo is easy to reach from the bedrooms, or for anyone coming around the corner from the kitchen. With a similar layout to the private bath, this room also features a large vanity with a good set of cupboards and drawers. And there's a linen closet in the hall as well! This 2nd full bath is easily accessible from the bedrooms in the hall. It’s tucked around the corner from the main living spaces, within reach, but out of the way enough to maintain a sense of privacy. With a tub/shower combo, and a big vanity this is a convenient and comfortable bathroom with a nice amount of storage. Additionally, you’ll find a linen closet just outside in the hall where more towels or sheets can be stowed away. The laundry room is conveniently adjacent to the kitchen and includes cupboards over the washer and dryer. A door on the left leads into the 2 car garage. Adjacent to the kitchen, this room makes doing laundry fit easily into the day. I’ve said this before, and I’ll say it again, “Hooray for the laundry room!” If you’ve ever been without one in the house, or you’ve lived where you have to trek down to a dark basement to clean your clothes, you feel me. Just step right in from the kitchen to check the dryer and get back to whatever else you were doing. Tuck detergents, cleaning supplies, and other odds and end up into the cupboards above the washer and dryer. The laundry is set between the kitchen and garage, so you can also step right through the laundry room into the 2 car garage where you’ll find a big set of tall pantry cupboards immediately on your left. There’s rafter storage as well, so you can keep a fair amount of camping gear, holiday decor, or other seasonal items out here without getting too cluttered and still have room to park the cars. Outside the garage a beautiful magnolia is just bursting into bloom on one side, and a gate leads into the fully fenced back yard on the other. A paved driveway leads from the alley on the west side of the lot into the 2 car garage. A magnolia is just starting to bloom in the side yard on the left, and a wooden gate leads into the back yard on the right beside the garage door. Manageable lawn space with landscaped beds and low maintenance rock in the fire pit and bbq area. A patio and deck extend the living area from the kitchen and become a second dining room in the warm season. Just outside the sliding doors from the kitchen and dining area, this patio and deck space are a private quiet spot to eat a meal, garden, and play. Mature trees include an ornamental plum and Japanese maple (trimmed by a professional arborist in the last couple of years). These stand at the back of the lot near the arborvitae hedge. When spring and summer come, you may find yourself eating meals on the back deck as often as you do indoors. Set up a dining table, string some light, hang a hammock, settle in a chaise lounge, and get the bbq going. This back yard combines a manageable lawn space with landscaped beds and low maintenance rock in the fire pit and bbq area. A patio and deck extend the living area from the kitchen and become a second dining room in the warm season. Anemones bloom beside the exterior garage wall and roses will show their colors in summer. Mature trees include an ornamental plum and Japanese maple. A professional arborist trimmed these beautiful trees within the last couple of years so you can sit and enjoy their shade at the back of the lot near the arborvitae hedge. A wide porch and landscaped yard welcome you to 1310 S Proctor. This home faces east and has a paved driveway into the attached garage at the back of the lot. Another look at the welcoming, east facing covered porch with its bright door flanked by big windows. Park on the street in front, or in the paved driveway, or garage in back. This front yard with its curving lawn and evergreen bushes is ready to bloom with white and blue hydrangeas, gorgeous orange and white roses, and spring columbine. Don't miss the succulents and hellebores near the front steps at the end of the paved front walk. Come on in! The Proctor Farmers’ Market is a 6 minute drive away and operates March 23rd - December 14th. Image from Valhalla Coffee Co. Just 1/2 a mile from the door of 1310 S Proctor. Set in Central Tacoma with parks less than a mile away in every direction, this home is also just over a mile from the heart of the Proctor District and 1/2 a mile from Valhalla Coffee Co, one of Tacoma’s favorite roasters. Looking for a caffeine free wake-up plan? You’re also just 1/2 a mile from Expand Yoga. Image from Expand Yoga. A ten minute walk and you’re here for practice. If you know Tacoma, you already know that Proctor is one of the most walkable communities in the city. If you don’t know us all very well yet, let’s get introduced. In Proctor, you have everything you need within walking distance, so it's a favorite place for people to park the car, carry some cloth shopping bags, and do errands on foot. 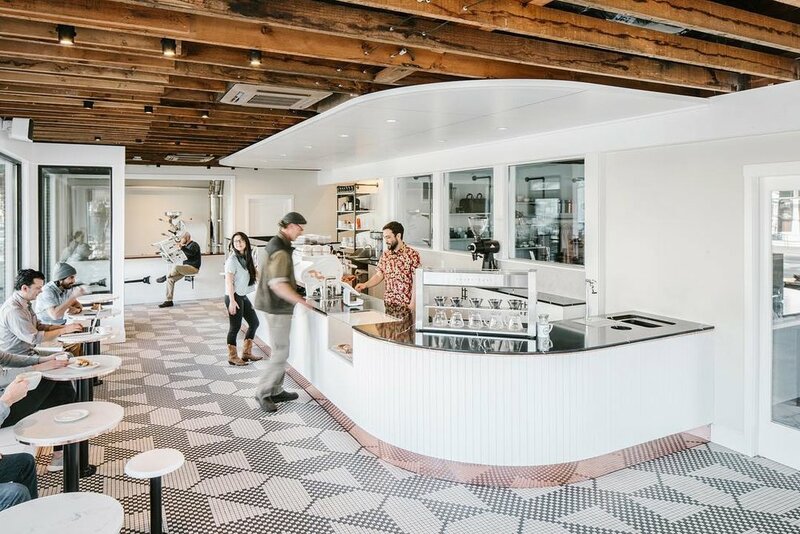 Inevitably, you’ll find yourself mixing in some fun with the to-do list; it's hard not to when there are cafes like Olympia Coffee Roasting and beautiful shops like Teaching Toys & Books, Compass Rose, The Proctor Mercantile, The Pacific Northwest Shop, and Lapis. These shops are just the beginning of what Proctor has to offer. Go visit and you might find yourself at Chalet Bowl or settling in for a film at the Blue Mouse Theatre. You can read even more about the Proctor community on our Neighborhoods Page. Image from Metro Parks Tacoma. Sunshine fun at Tacoma Nature Center’s playground, less than a mile away! Come see this Tacoma bungalow in person! In the meantime, for more information about this Central Tacoma home, call or text me, Michael Duggan, at 253-226-2787. I'll be happy to answer your questions about this home or the local real estate market in general.